William Jennings Bryan was a hero for the common man, which meant he was a bitter opponent of the giant corporate trusts of the day. 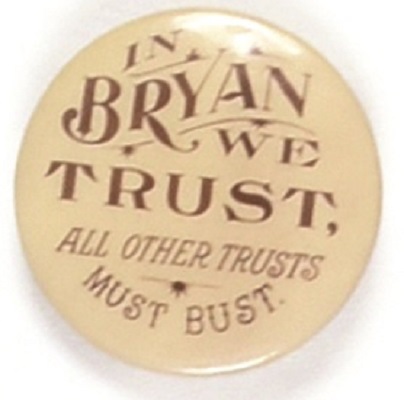 This scarce 1 1/4 inch celluloid makes that plain: “In Bryan We Trust, All Other Trusts Must Bust.” I understand that this is just a slogan pin, but I do not recall ever offering it before. Excellent condition.